EmmaRose Crafts is a family run business. We have a lifelong passion for crafts and never enough hours in the day to do all the things we want to do. We believe there is nothing quite like the enjoyment and satisfaction of making items for yourself, your family & friends, or your home. 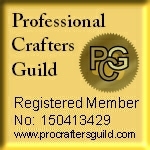 Craft items make lovely gifts too, for beginners right through to those with more experience. We like items that are a little more classic, like the Calico and Lace cushions, but we also want plenty of fun designs, like the Halloween cushion and throw. And we don't like to limit our crafts so you will find both fabric and yarn kits and patterns of all kinds - which means you can enjoy working on a project using familiar skills or you could try something different and experience the pleasure that comes from developing your creative talents. The idea of creating a company to share our love of all things crafty has been a dream for several years, but always something we kept at the back of our minds, never really expecting it to be a possibility. But no more! The time has come to make our dreams come true and we truly hope you will come on this journey with us.